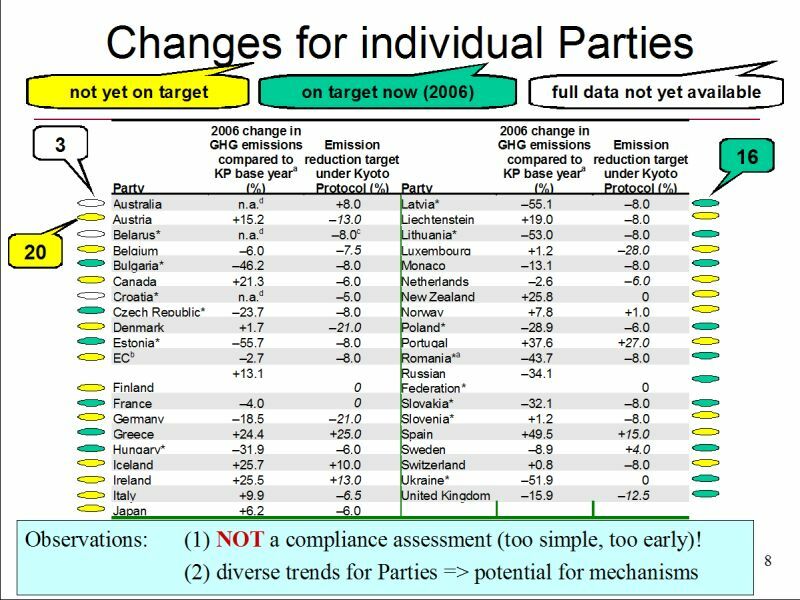 According to several sources, out of the 39 countries under the Kyoto Protocol, only 16 are meeting their targets while 20 aren’t due to do so as only three years remain. The United Nations issued an interesting presentation with a table (left) that sums up very well the situation at hand. Now everyone can see in a glance how partaking countries are scoring. Emissions from industrialized countries plateaued in 2006 after six years of growth, the United Nations said Monday. But the countries have not yet reported emissions from the past two years, and the new report did not include large emerging economies like those of India and China. The United Nations report was released two weeks before the world’s environmental ministers are to meet in Poland to discuss ways to curb greenhouse gases and against the backdrop of the global financial crisis. In presenting the latest findings, United Nations officials said they were concerned that the economic downturn would add a new layer of uncertainty to the coming talks, because many of the programs under development to curb the emissions that cause global warming require credit and financing. While they expressed some optimism about the new data, which went through 2006, the last year available, they said the slight decline — one-tenth of 1 percent from 2005 to 2006 — was too small to indicate a significant downward trend. Mr. de Boer said he found some cause for hope in the figures issued Monday. “What I saw was a slowing of the increase in emission from industrialized countries,” he said. But his statistician, Sergey Kononov, pointed out that the percentage decline had been so small that it could have been caused by either improved policies or simply the relatively warm 2005-2006 winter. (…) But the world has changed since Bali. The United States, a reluctant participant in the United Nations meeting last year, now has a president-elect, Barack Obama, who has pledged to make climate change a centerpiece of his administration. Perhaps more important, fallout from a global economic crisis has turned the economics of climate change upside down. Indeed, he and others have expressed hope that some nations will renew their economies by investing in green jobs and green growth, a proposal put forth by Mr. Obama during the campaign and endorsed by nongovernmental organizations like the Clinton Foundation. United Nations officials said Monday that Mr. Obama would not attend the meeting, but expressed hope that the United States delegation would work closely with the next administration, which takes office in January. Unlike the Bush administration, Mr. Obama supports a cap-and-trade system, similar to the one that operates in the European Union. (…) With the new administration poised to take power in the United States, “I think everyone’s waiting for a discussion between the United States and China, the two biggest emitters and the two countries that haven’t been at the table,” Mr. Sachs said. For more on this topic, please check out this article on TreeHugger.